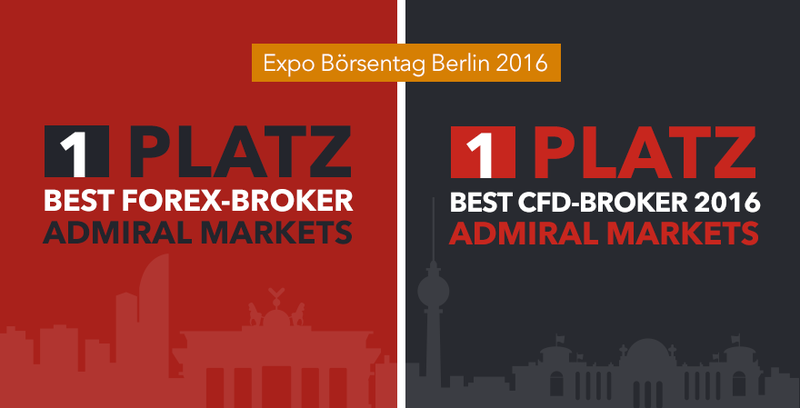 This October, at the Expo Börsentag Berlin 2016, Admiral Markets UK received awards in two categories: "Best Forex Broker 2016" and "Best CFD Broker 2016". The event was organised by BrokerVergleich.de: over 3,000 clients voted for brokers in different categories. The process of selecting the winners in each category included both popular votes and objective ranking. The latter focused on a comprehensive overview of financial service – from spreads and costs to customer support. This means these award are not only a symbol of trust that the clients put into Admiral Markets, but also a testament to the company's reliability. "We are very honoured that our practices and standards have been recognised by the clients and also the industry specialists," said Admiral Markets Germany spokesperson Jens Chrzanowski. "Awards like these motivate us to constantly get better and provide the best possible trading service to our clients."